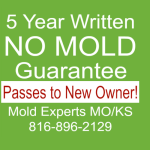 Mold Experts of Missouri & Kansas have been providing customers in the Greater Kansas City area with quality mold services for many years. If you have or think you may have a mold issue, we are the experienced, reliable, certified mold company you need to use. We are here to provide the best solution for any mold issue you may encounter in your home or business. Mold Experts of MO/KS offer free estimates for mold removal. We follow the correct procedures for mold removal in your home to insure that your family is completely safe during remediation and that the air you breathe in your home will again be the healthiest air possible. After all, your family deserves it! Mold Experts of Missouri & Kansas will preform a full mold inspection and testing in your home. We will have the air samples or tape samples analyzed by an independent, licensed, certified laboratory, providing you with a detailed report of the types of mold in your home THE NEXT DAY. We will also provide the process for mold removal. We take calibrated air samples in your home and you get the results in 24 hours from an independent lab. This is the only way you will truly know the IAQ (Indoor Air Quality) of your home. Peace of mind is certainly worth it when it comes to your family. And many others.. Call (816) 896-2129 for details. Mold Concerns? Prompt Response is Key! If you are concerned that mold in is your home, time is of the essence. Mold gives off mold spores into the air and these can contain mycotoxins that can effect the health of everyone exposed. It may be no more than allergy symptoms, but in the very young and senior citizens, it can be more toxic. Now is not the time to just wonder if it is causing health problems, you should take action to protect the health of your loved ones. We are the gentlemen of the industry. Our techs are courteous and well-mannered, allowing us to guarantee the highest level of customer service! Our trucks have no signs on them, so your neighbors don’t have to know your concerns. Not Sure if You Have a Mold Situation? Are you sure the air in your home is safe? When you experience water damage or mold in your home or commercial building, immediate response is imperative to prevent further mold growth. 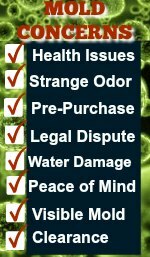 If you are experiencing any of these signs, call Mold Experts of Missouri & Kansas now at (816) 896-2129. Never Attempt to Remove Mold Yourself or Have it Removed by a General Contractor. Only Certified Mold Removers Have the Training and Equipment to Remove it Permanently and Safely.